Happy Veteran’s Day! I am so very thankful for the men and women who served our country to give us our freedom. I don’t think that we show this enough all year. It’s a huge sacrifice to put your life on the line for people all around the country that you don’t even know and I am eternally grateful for those who have done so! 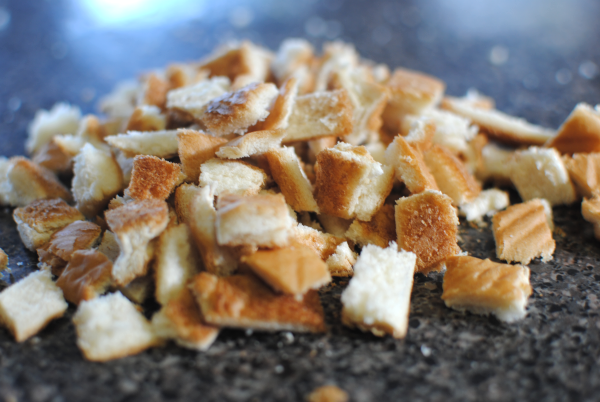 While I do like my salad, I also really like croutons. 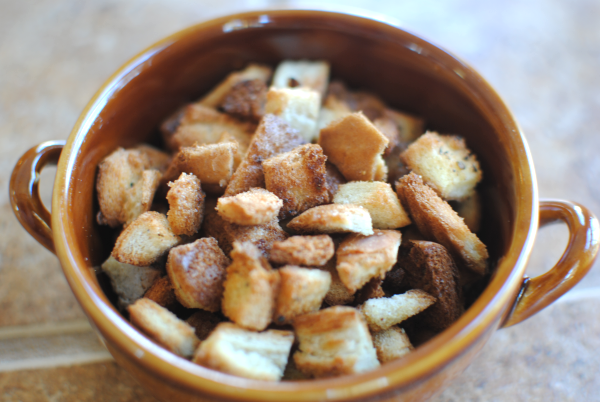 Like, really really like croutons. They are kinda like potato chips to me. Once I start, I can’t stop. Do you have kiddos who don’t like the crust on their sandwiches? Or perhaps you make things that require you to cut off the crusts. It’s recycling in a way. 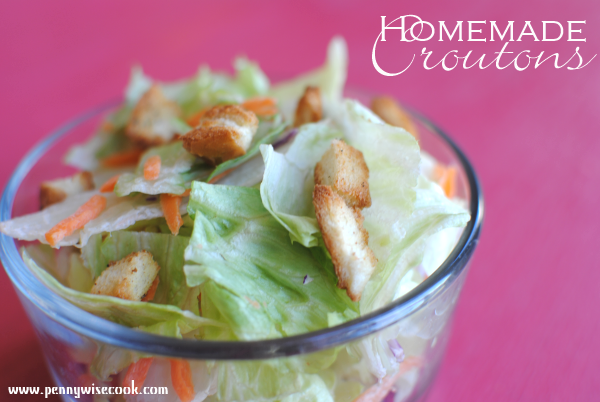 You can even freeze the crusts and make croutons later if you don’t have time right away. Just thaw them out before preparing to make croutons. How awesome is that? Try to line them up and then just cut them into smaller pieces like above. They already look just like croutons don’t they? And in minutes they will be! Preheat the oven to 400°. Spread them quite evenly onto a cookie sheet. Spray them well with olive oil cooking spray or butter cooking spray like me. Sprinkle with seasonings of your choice. I used italian seasoning and garlic powder. Bake for about 4-8 minutes depending on your oven and you’re done. Store them in an airtight container and pop them out when you’re ready to eat a salad. …Ok, maybe I do. Don’t judge. 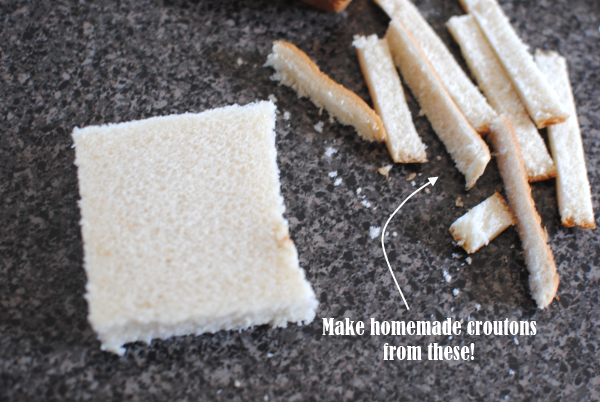 Here’s a double duty tip when you have leftover bread crusts. 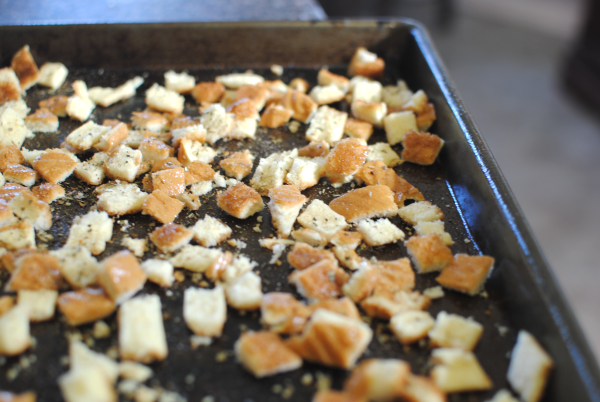 Make up a batch of healthy and homemade croutons! Cut crusts into smaller square pieces or desired size. Spread evenly onto a cookie sheet. Bake for 4-8 minutes watching during baking to make sure they don’t burn. Mine took about 8 minutes. I also adore that Magic Shell liquid that you pour over your ice cream. You know the stuff. It starts as a liquid, but the minute that it hits your ice cream it starts to harden and forms a shell. It’s basically the same thing as the dipped cones from Sonic. No wonder I love the stuff. It was only recently that I found out how extremely SIMPLE it is to make magic shell. You can pay around $3 bucks for a bottle of it at the store. After you read this recipe, you may never purchase it ever again. I know I won’t. There’s something about the fun of starting off with a liquid and watching it turn to a solid. Brings me back to high school when we would do science lab. I was usually pretty bored until we did the hands-on experiments. 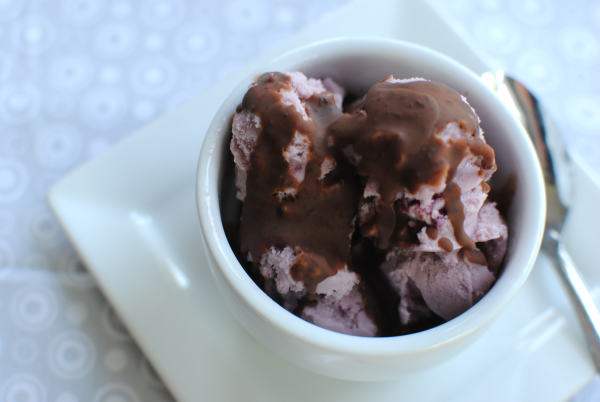 You see the TWO ingredients that are used to make this lovely, tasty, and sweet ice cream topping combine together to make your own little science experiment each time that you eat a bowl of ice cream. Coconut oil is the ingredient that essentially causes the hardening with contact to the cold. And then of course, you have your chocolate chips that mix with the coconut oil to create the “shell”. 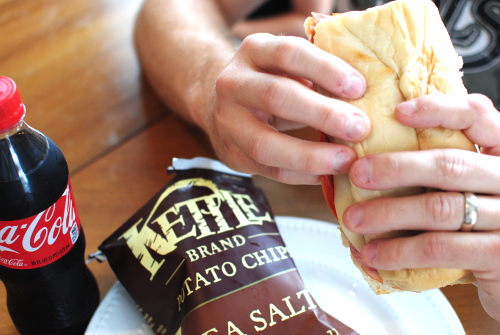 You can use your favorite flavor of chips to make this. Use butterscotch chips, white chocolate, dark chocolate, milk, or semi-sweet. I store mine in an old chocolate syrup bottle. With the coconut oil as an ingredient, it tends to harden in the bottle after a while at room temp. 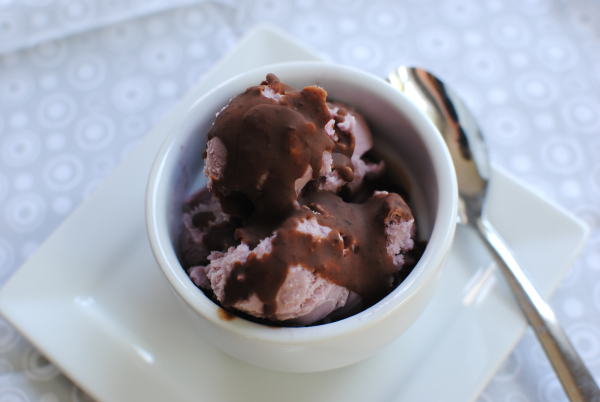 Simply pop it in the microwave for about 30 seconds and it’ll be back to liquid and ready to create a chocolate shell over your ice cream. Recipe courtesy of I Wash, You Dry. 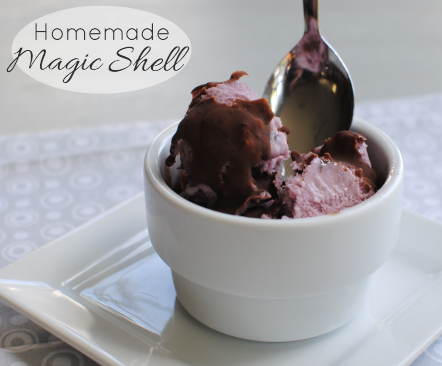 With just 2 ingredients, you can create your own magic shell without a trip to the store! In a large microwavable bowl, combine the coconut oil and chocolate chips. 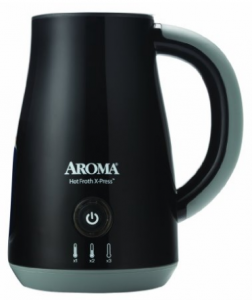 Microwave at intervals of 30 seconds at 50% power, stirring between intervals. 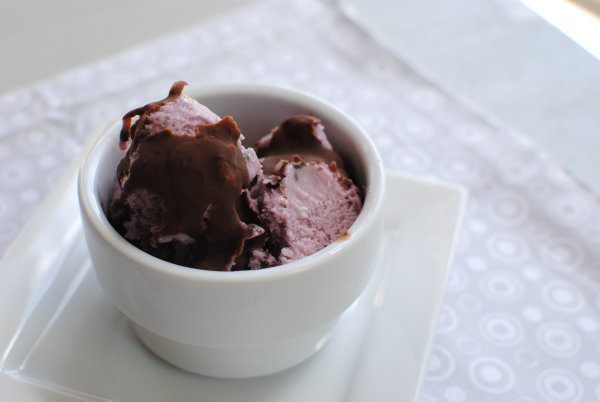 Pour over ice cream and allow to dry and harden. 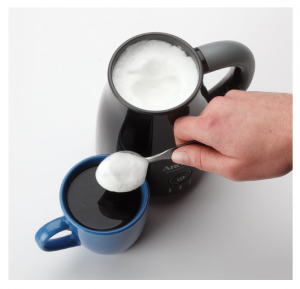 If your magic shell hardens in the bottle, microwave it for about 30 seconds to get it back to a liquid again. I’ve recently gotten the nickname “Becky Homecky” from my mom. Had you asked me 5 years ago if I would be creating recipes, crafts, and projects then I probably would have said absolutely not. Not just because I was working at the time, but also because I never really had the urge to do anything so Betty Crocker-ish. These days I find these things to be completely stress-relieving and better yet, fun. Every Christmas for the past 5 years, I’ve said I’m going to make homemade Christmas gifts to save money and to put a little thought into my gifts. And almost every year, I get down to the wire and never get around to it. This year, I’m determined to make it happen. I’m starting with these gift jars. There are about a million combinations for gift jars these days. 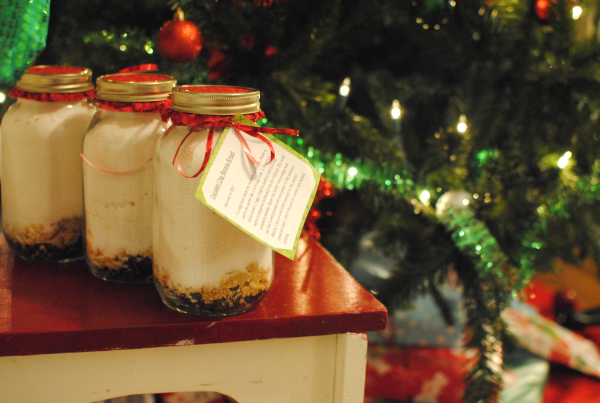 You name it, you can gift it in a jar. 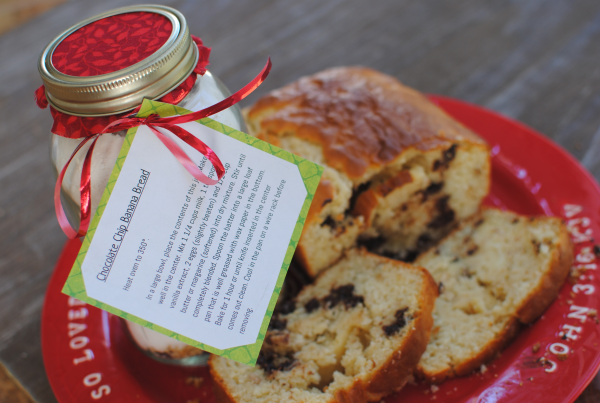 My daughter suggested that we try Banana Bread Gift Jars the other night. I told her that I wasn’t sure that you could do that because bananas can’t rightly be put in a jar and keep. 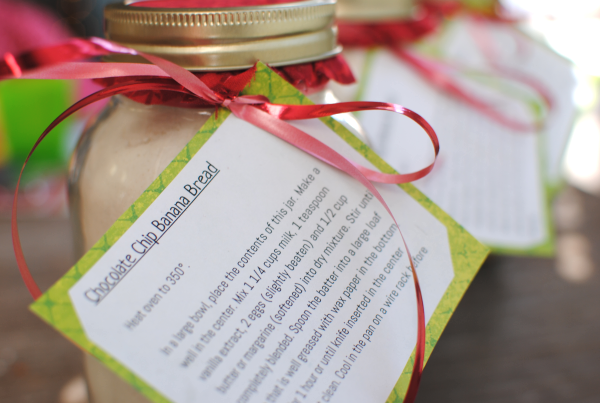 Then I came across this recipe at Recipe Goldmine for Chocolate Chip Banana Bread in a Jar. Never having made mixes in a jar like this, I wanted to go with a tried and true recipe before branching out into experimentation. I found it interesting that using dried banana chips for the banana part actually ended up tasting like regular bananas. And the chocolate, come on. YUM is the only word to describe chocolate and bananas. I got my jars at Walmart for around $8 for 12 of them including tops. I used some fabrics pieces that I already had along with some red string to dress the jars up a bit. I printed out the instructions for making the bread and glued it to a piece of scrapbook paper. Then punched a hole and tied it to the jar. These make such great gifts for teachers and coworkers. And they are inexpensive too. My favorite part! Recipe courtesy of Recipe Goldmine. 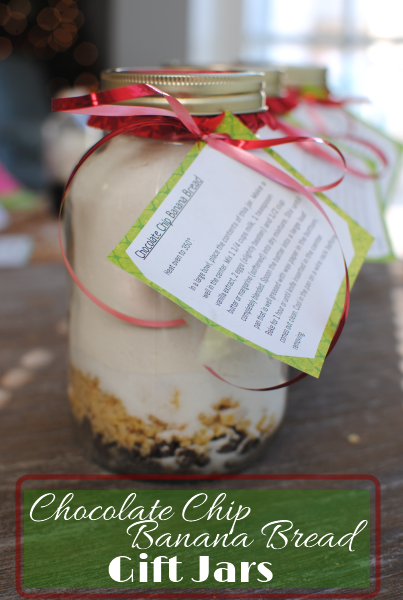 Easily create homemade gift jars for yummy Chocolate Chip Banana Bread! Layer all ingredients in a quart-size jar in order they are given. Press the layers down firmly before adding next layer. In a large bowl, place the contents of this jar. Make a well in the center. Mix 1 1/4 cups milk, 1 teaspoon vanilla extract, 2 eggs (slightly beaten) and 1/2 cup butter or margarine (softened) into dry mixture. Stir until completely blended. Spoon the batter into a large loaf pan that is well greased with wax paper in the bottom. Bake for 1 hour or until knife inserted in the center comes out clean. Cool in the pan on a wire rack before removing. Now that I’ve thoroughly dissed myself, we’ll move on to this awesome new revelation that I’ve made! 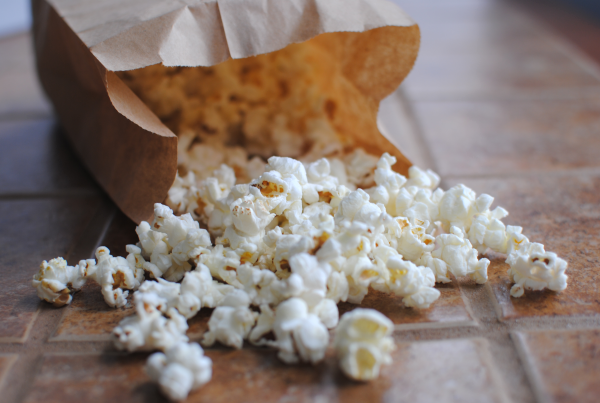 It’s been a long time, but a friend of mine guest posted on Saving with Amy about how to make your own popcorn. I remember reading it and thinking oh that’s neat and looks really easy. And then I just moved on with my life to never try it out for myself. Not sure why I didn’t because I am HOOKED on this stuff now! 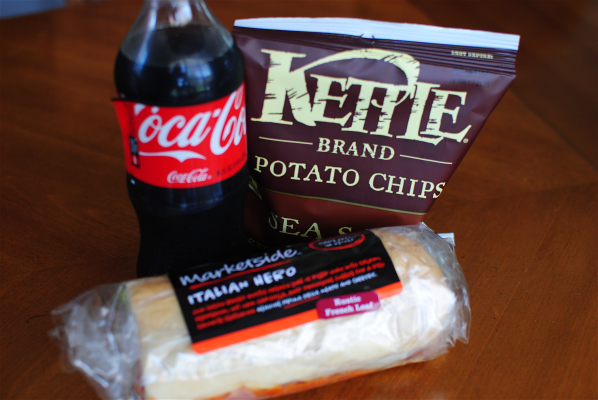 You see, to make about 8 or 9 cups of your very own popcorn, all you need is a brown bag like this one. You can get 50 of them at Dollar Tree for a buck! And you need 1/3 cup of unpopped kernels. You can also get these at Dollar Tree for a buck! Have you ever looked inside one of those prepackaged bags of popcorn? There are all sorts of things in there that are pretty much unnecessary. Sure it’s nice to have salt or butter flavor, but with all the added fat too? 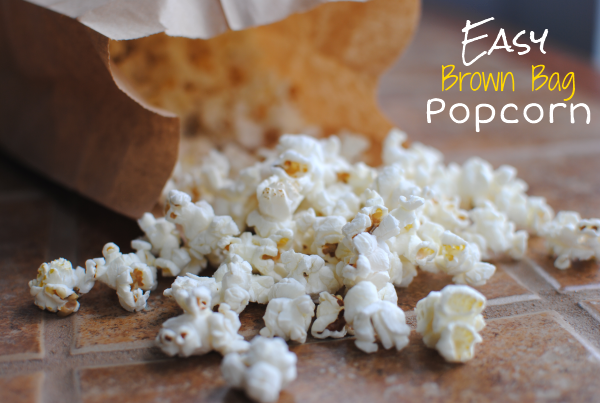 This easy brown bag method makes it easy to make pure popped corn without adding any extra nonsense. In fact, I actually like it plain just like this. No butter or salt needed! Just try it once and you’ll be hooked like me. It’s too incredibly simple not to. 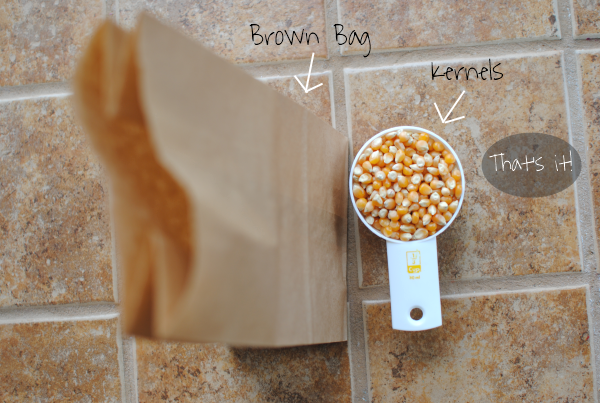 A brown paper sack and popcorn kernels are all you need to make your very own popcorn! Pour to kernels into the brown bag. Fold the top down about 2 times. Place in microwave and heat on full power for 1:45- 2 minutes. 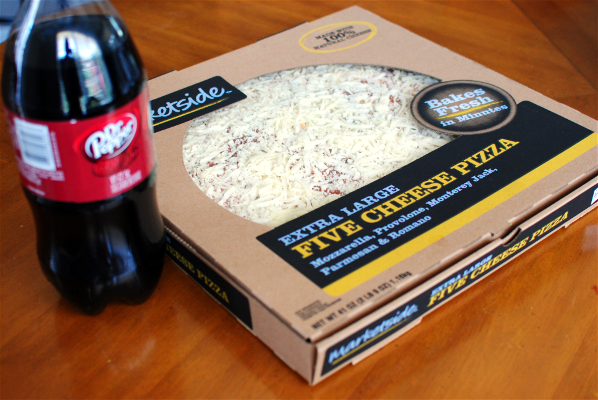 This will depend on your microwave, but 2 minutes is about right for mine. Just stop it once there is about 2-3 seconds between kernel pops. How was your weekend? Mine was FABULOUS! Yes, for once I have to say that every single moment was enjoyable. Friday was an impromptu family night which consisted of homemade tacos (mommy didn’t have to “cook”), settling in to watch The Lorax (highly recommended! ), and finished off with sundaes complete with cherries on top. Saturday was pretty leisurely. We went to the pet shop to see the animals (cheap entertainment for sure) and ended at Chick-fil-A where we used coupons for FREE Icedreams and played in the playplace. Does a frugal family weekend get any better? And of course, church on Sunday morning. Which I might have an update on our search coming up so be sure to look for that. Months of searching may have led us right back where we began. Funny how God works, isn’t it? I was excited to find a deal on peanuts recently as part of the Publix BOGO sale recently. One thing on my list to try and make was peanut butter. It’s seriously been on my list for like months. Now that I’ve made it, I feel like an imbecile because of how simple it is. 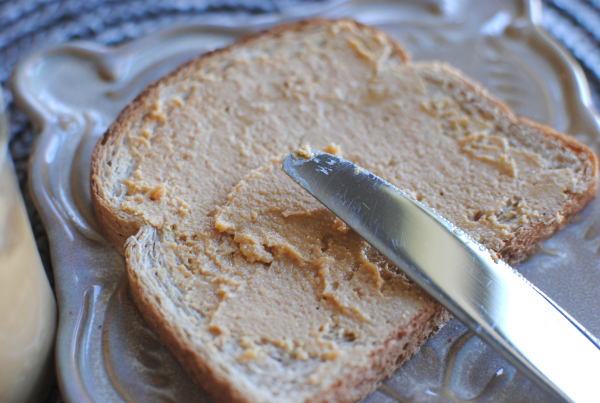 I would have been making my own peanut butter for months had I known how easy it really is. THIS is all you need to make it. Peanuts (DUH), a little bit of oil (whatever kind you have: peanut, canola, vegetable, it really doesn’t matter) and a dash of salt which didn’t make it in my picture. Other optional ingredients include cocoa powder, honey, sugar, brown sugar. You’ll also want to have a food processor and something to store your homemade peanut butter in. See what I’m saying? Simplicity at it’s finest here folks. I stored mine in some pint-size mason jars that I had. It’s worked out well. 1 jar of peanuts made me 2 of these jars of peanut butter. My girls are in absolute love with this peanut butter. I even overheard Addie saying to her daddy yesterday that “I really love momma’s peanut butter. It’s goooooooooood.” I was glowing from the other room y’all. I hardly ever get compliments like that. The only criticism that I received from the hubby was that it might need just a tad bit more salt. I was holding off on too much in case it became too salty. But I know to add just a tad more next time. Storage: Your peanut butter isn’t equipped with shelf stabilizing ingredients so it will need to be refrigerated. It will last in the refrigerator for up to 4 weeks. (If your family lets it last that long!) You can also FREEZE it! Place it in an airtight container and freeze for up to 6 months. Just be sure to let it thaw before you use it again. 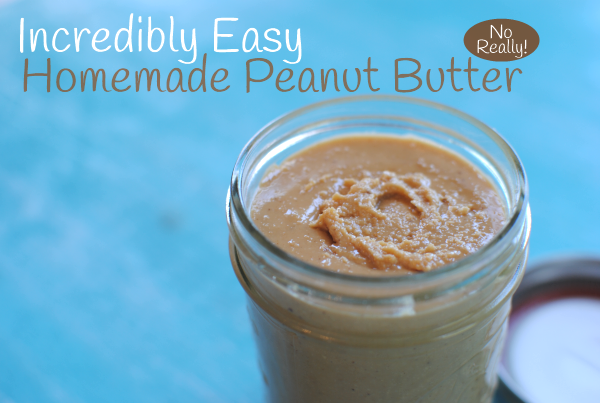 Are you ready to impress your family with your own homemade peanut butter? 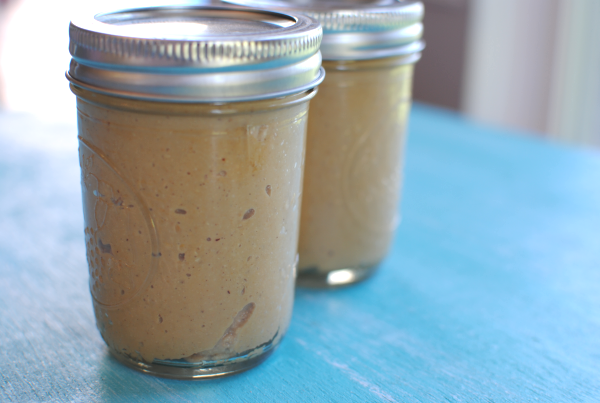 You’ll never believe how simple it really is to create your own peanut butter at home! 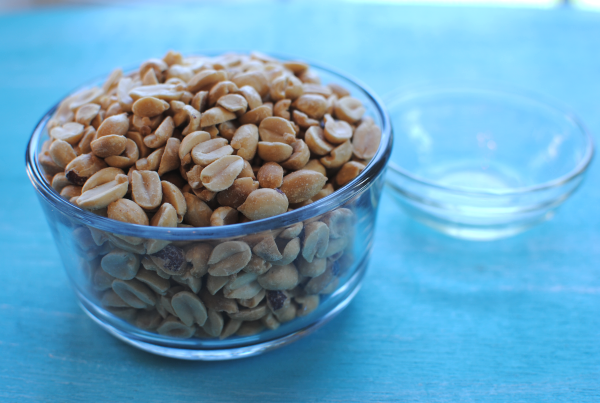 In a food processor, combine peanuts, oil, and salt. Process until desired consistency and smooth. It may take a couple of minutes for the peanuts to come to a desirable consistency. They first get chopped, then they begin to really form a paste and then butter. The oil is completely optional as well. If you’re going for a more natural peanut butter, the peanuts actually have their own oil so it’s not absolutely necessary to add the oil. Just makes for a smoother butter. One thing that you may not know about me is that I have an obsession with mugs. No, not with faces, but with the ceramic formations that hold the most incredible substance that keeps me going every day, coffee. I only started to drink coffee about a year and a 1/2 ago and yet it sucked me in so fast that I didn’t even know what was happening! When I noticed that there wasn’t any place to put regular glasses in my cabinet, I decided that something need to be done. I needed a place just for mugs. After all, they are worthy. I started with cheap board from Lowes. I had them cut it to 2 feet so that it would fit on the side of my cabinet. I didn’t want anything too thick, but I wanted it thick enough to hold screw hooks well. 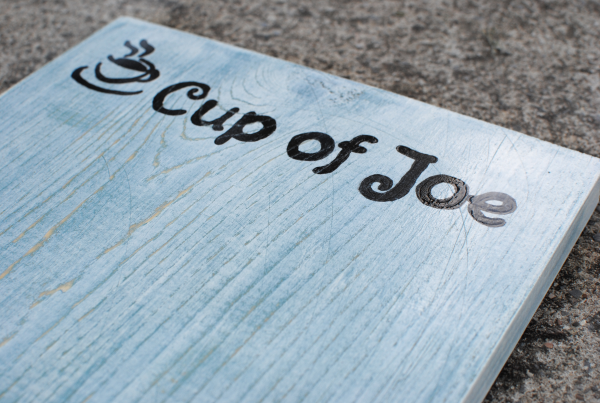 I believe this board is 1 inch thick which turned out just right. 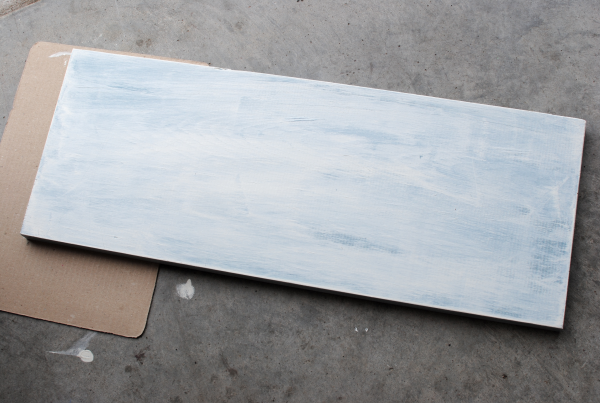 I painted the board with a light blue before lightly painting over it with an off-white. Then I sanded it a bit to distress it. And in the process I got paint on the garage floor. It needed some color anyways. I found this fantastic technique for transferring text onto wood at Elm Street Life. 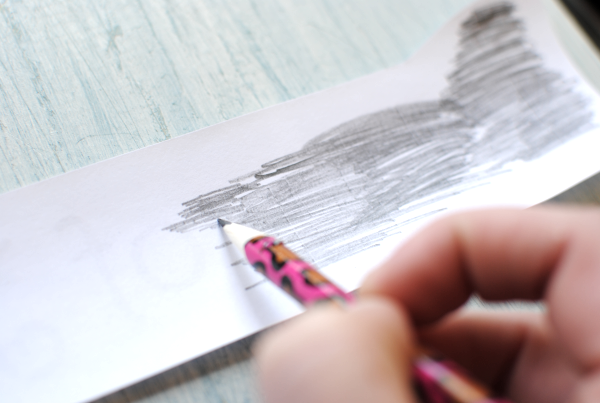 It doesn’t get any simpler than your printer, a pencil, and a pen. Print off the text of your choice from your printer. No need for reversing the text or anything. Cut out most of the white surrounding the text. Then using a lead pencil, color the back of each letter like the picture above. The need for a cheetah print pencil is not necessary, but it helps to make you feel awesome. I may have gone a bit overkill, but here’s what it will look like on the back. Tape your words lightly to your wood so it won’t try coming up on you. 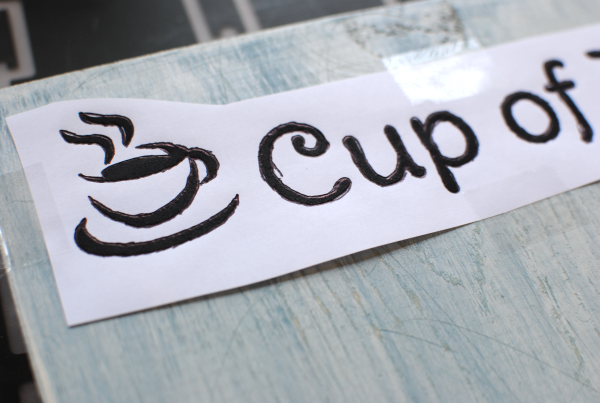 Using a pen, trace around each letter firmly. 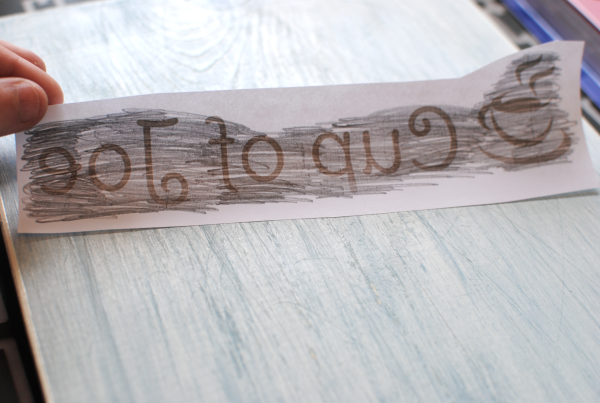 The lead will transfer to the wood and you’ll be left with an outline of your words. Like this! 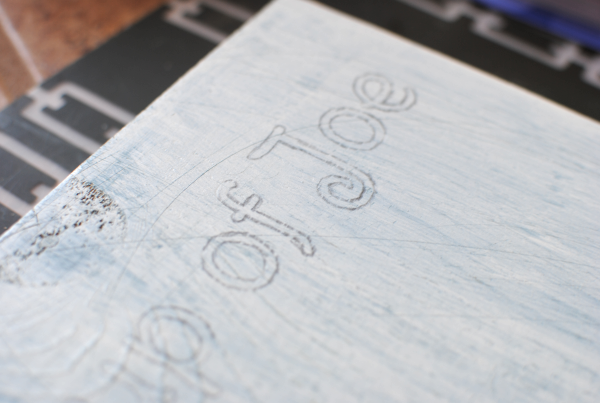 Then you can use a brush (if you’re brave) or a paint pen to fill in the outline. They actually make an assortment of paint pens these days which is nice. Just remember that it doesn’t have to be perfect. You can always sand it a little and if you’re going for a vintage feel anyways, it wouldn’t look perfect either. 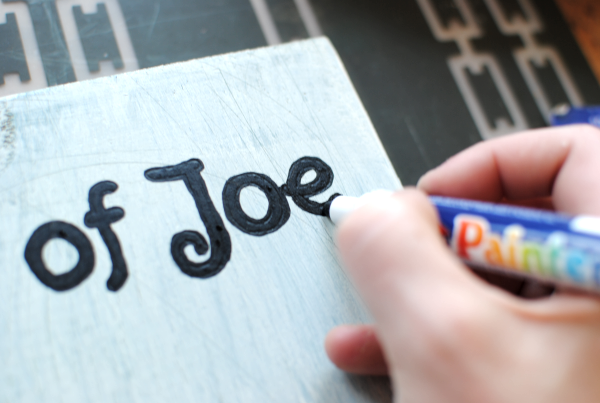 Use your paint pen to go around the letters and then fill them in. When buying your paint pens, be sure to look at what kind of tip you are getting. Some are made for calligraphy and others for painting. I don’t suggest the calligraphy tips for this. Tah dah! We have a board. We have text on the board. 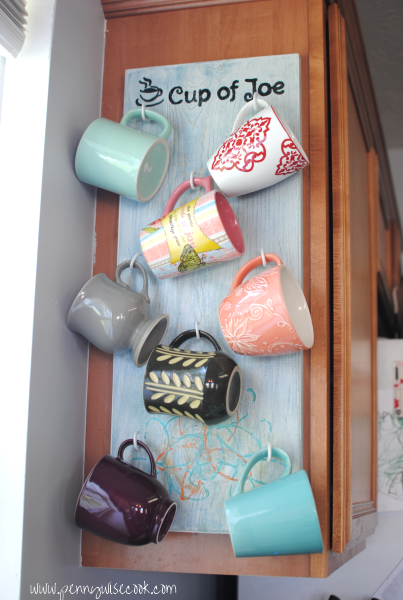 now we just need hooks and mugs for our mug holder! 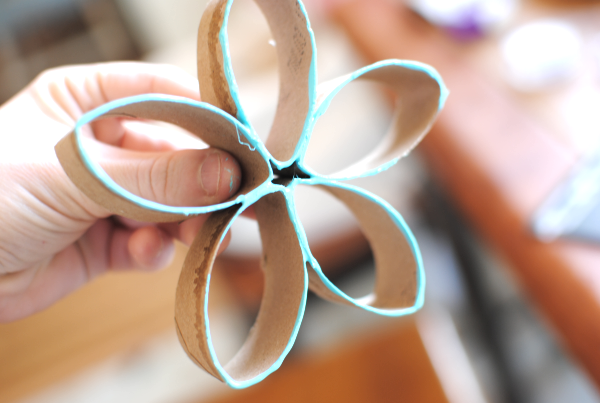 You may have seen my post on Toilet Paper Roll Art. It’s quite genius and is so simple and fun. 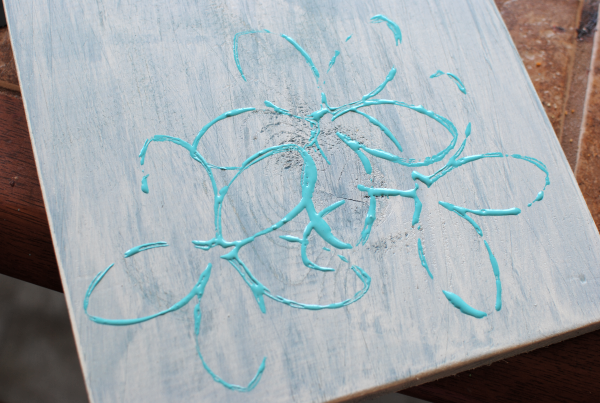 I used a paper towel roll to create this flower and then dipped it into some of my favorite aqua paint. I gave the board a little detail with my flowers and I even added an orange one on top to give it some more color. I let it dry and then screwed in the hooks in an unexpected way. Or at least it was unexpected to my husband. He thought I would have made it a little more uniform, but as I started hooking them in, it seemed to make more room with them being offset this way. 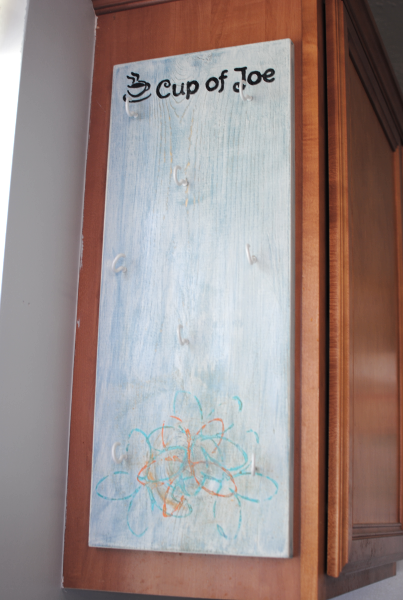 UPDATE: We hung this by screwing screws directly through the backside of the cabinet into the board itself. We used 4 screws total and it holds just fine. And there you have it! 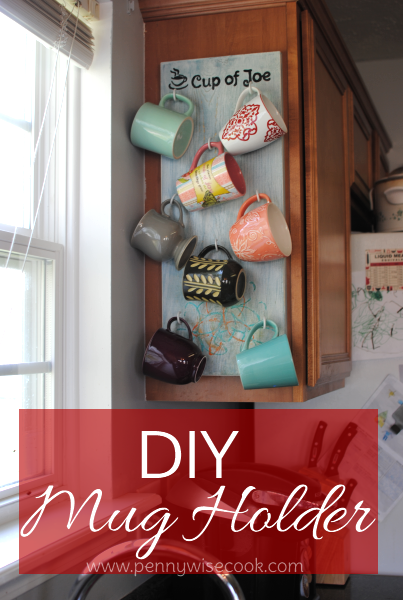 A simple yet cute way to display your coffee mug obsession (if you have one) and to give your cabinets a little more room. It’s not just functional, but it looks really cool too. We’re going to make one for my husband’s mugs for the other side too. So I told you how I’ve been keeping things on the easy side the last few weeks. With Addie starting kindergarten and with family in town off and on these last couple weeks, the cooking has been a little out of routine. Out of routine meaning that I didn’t want to bore my guests with my food portraiture and involvement with my food. So I opted for easy yet tasty. The other day I was talking to my mom about the Crockpot Baked Potatoes when she mentioned that she had also used her Crockpot to make up some corn on the cob. We usually just pop our corn on the grill when we’re grilling out, but it’s been so hot lately that we haven’t wanted to be outside for more than 10 minutes. Though, it’s FINALLY beginning to cool down just a bit around here. So to save a little propane and heat from the stove or oven, I decided to throw some ears in my slow cooker. I seasoned them up with a little mayo concoction that I put together, then rolled them up in foil and placed them straight down into the slow cooker. I didn’t add water, I didn’t put anything inside to raise them away from the sides. I didn’t do anything at all, but just let them go. It worked great! The steam from the moisture in the corn is what cooks it. With sweet corn being so cheap (in places not affected by the droughts), it’s an easy and tasty side dish for just about anything. Plus you can use corn on the cob to make up creamed corn, corn bread or muffins, and more. 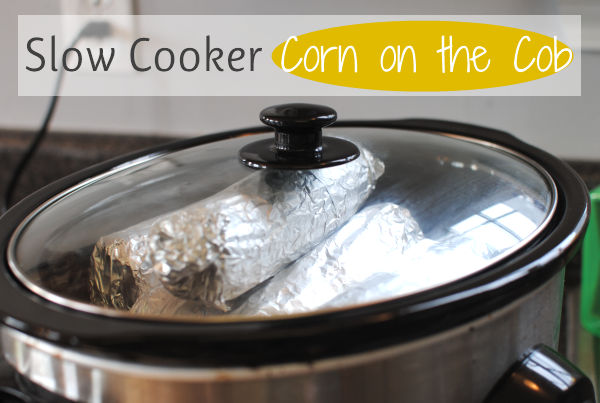 If you need cooked corn for a recipe and want it fresh, throw some ears into your slow cooker overnight and in the morning you’ll be ready with slow cooked and perfect corn! 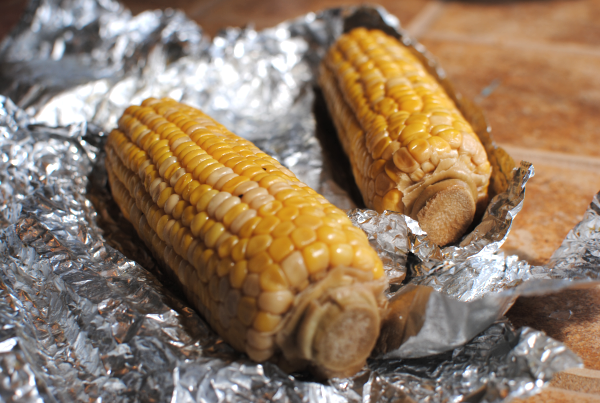 Another shortcut idea that makes corn as simple as 1,2, 3 to make! Whip ingredients together and rub 1/4 mixture onto each ear of corn. 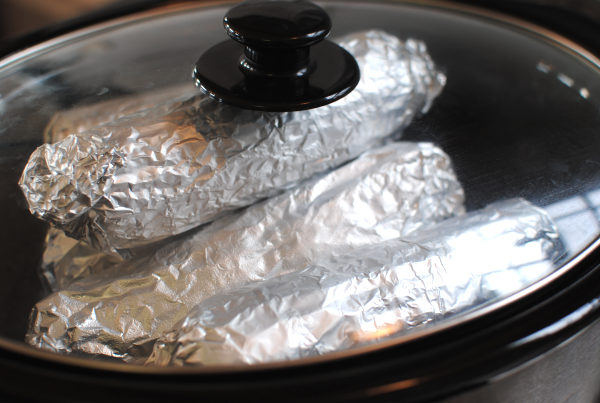 Wrap in foil and place in slow cooker. Cook on lowest setting for 4-6 hours. I used the low setting on my slow cooker, but if you have a “warm” you might consider using that for longer cook times.